To win an award for my writing is an extra special thrill for a person who never won a thing for sport. 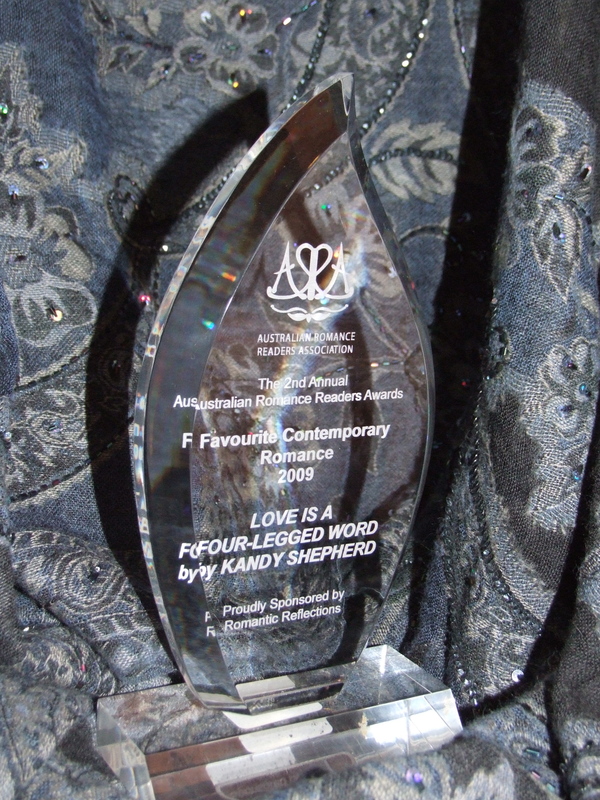 Thank you ARRA (Australian Romance Readers Association) for my elegant trophy, awarded to LOVE IS A FOUR-LEGGED WORD for Favorite Contemporary Romance 2009. This award is so special for me because it is a reader-nominated award for “favorite” book, not “best”, but “favorite” and that means a lot. Also, my books are not readily available in Australia—readers buy them from a group of fabulous specialist romance bookshops or online. My family has shelves groaning under the weight of the awards they’ve won for various sports—not something I excel at. My ARRA trophy stands on a shelf in my study—next to a stack of my other wonderful “trophies”, copies of LOVE IS A FOUR-LEGGED WORD and an ARC (advanced review copy) of HOME IS WHERE THE BARK IS. Proud as I am of my family’s trophies, I’m super proud of mine, too! how it made them hungry! (The heroine of LOVE IS A FOUR-LEGGED WORD is a chef…) No matter what kind of mood I’m in, when I open my email to find a letter like that the day becomes immeasurably happier. Thank you! WHAT I’M READING NOW: the unauthorized biography of OPRAH by Kitty Kelley—fascinating stuff! Like untold millions, I’m an Oprah fan and it’s compulsive reading—all 520 pages of it— to find out so much more about her.